“Here Comes the Sun Little Darling”… After the stormy afternoon, this Beatles song comes to mind. It’s amazing how fast our weather has changed this afternoon. We had severe storms in the Tuscaloosa area less than 2 hours ago. 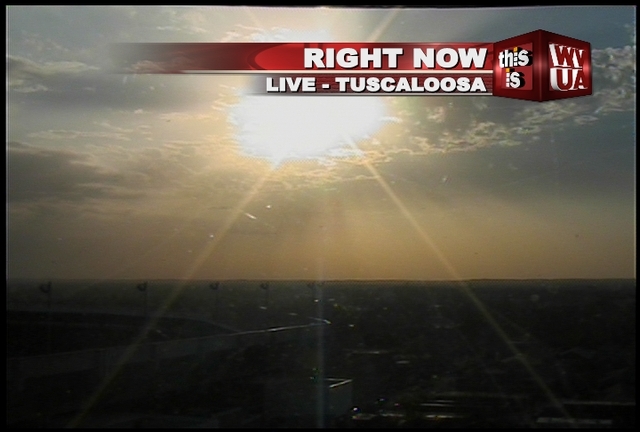 Here’s our view of Tuscaloosa now, with the sun breaking through the clouds. 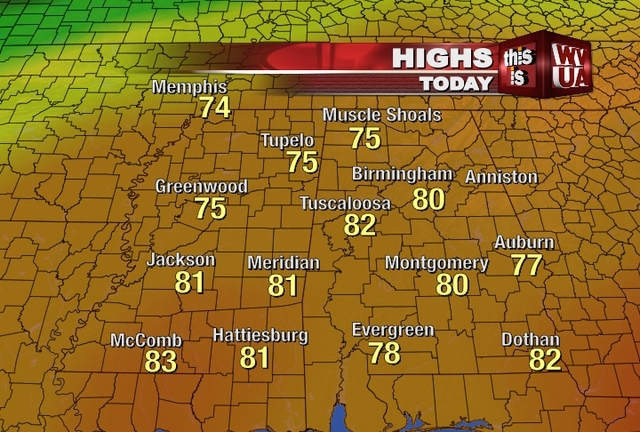 With some high level clouds in the area, we will have a very nice sunset in west and central Alabama in an hour or so. Be sure to scroll down for an update on your forecast. Have a great day! AT 435 PM CST…NATIONAL WEATHER SERVICE DOPPLER RADAR INDICATED A SEVERE THUNDERSTORM CAPABLE OF PRODUCING QUARTER SIZE HAIL…AND DAMAGING WINDS IN EXCESS OF 60 MPH. THIS STORM WAS LOCATED 5 MILES WEST OF VALLEY GRANDE…MOVING EAST AT 55 MPH. LOCATIONS IMPACTED INCLUDE… BURNSVILLE…GARDNER ISLAND…MULBERRY…BILLINGSLEY…VIDA JUNCTION…AUTAUGAVILLE…BARRETT CREEK…VALLEY CREEK JUNCTION… PLANTERSVILLE AND DAWSON MILL. A TORNADO WATCH REMAINS IN EFFECT FOR THE WARNED AREA. TORNADOES CAN DEVELOP QUICKLY FROM SEVERE THUNDERSTORMS. ALTHOUGH NOT IMMEDIATELY LIKELY…IF A TORNADO IS SPOTTED ACT QUICKLY AND MOVE TO A PLACE OF SAFETY INSIDE A STURDY STRUCTURE…SUCH AS A BASEMENT OR SMALL INTERIOR ROOM. After today’s severe weather threat, the rest of the forecast is looking a little more settled; atleast until we get to the weekend. Temperatures will be a little cooler tomorrow, with a high between 64 and 67. Skies will become sunny tomorrow, with a north breeze at 5 to 10 mph. After a cool Wednesday morning, a nice warming trend is back in store, with highs back in the lower 70s. A few extra clouds will likely swing by on Wednesday and early Thursday, but they will come and go, as more sun is likely by Thursday afternoon. Temperatures will remain in the lower 70s for highs through the first half of the weekend before another storm system approaches our area. Showers and storms become a good bet on Saturday, with some strong storms being possible. Model data is rather inconsistent with this next feature, so we’ll have to keep an eye on any surprises over the next day or two. Some cooler air looks to arrive on Sunday and Monday, as highs return into the 60s. It’s possible that temperatures fall into the 50s on Sunday, but that looks unlikely at this point. Skies will become mostly sunny again by early next week. Be sure to join me today at 4, 5, 6 and 10 on WVUA-TV for the latest on your forecast. Have a great day! The severe weather threat is ending over west Alabama, where drier conditions are filtering into the state. A cold front is moving into Tuscaloosa now, with a broken line of strong to severe storms just ahead of the front. The severe weather threat is now over for the city of Tuscaloosa. A tornado watch is in place for everyone until 7pm tonight, but the watch will be trimmed back from west to east, as the front continues to move through our area. The storms should be to Centreville, Marion and Demopolis by 3:45pm. Expect the possibility of strong winds, large hail and an isolated tornado. The tornado threat is much lower over central Alabama, but the chance is still there. Once the storms move through your area, the severe weather threat will quickly diminish. * AT 254 PM CST…THE NATIONAL WEATHER SERVICE INDICATED A LINE OF SEVERE THUNDERSTORMS CAPABLE OF PRODUCING QUARTER SIZE HAIL…AND DAMAGING WINDS IN EXCESS OF 60 MPH. THESE STORMS WERE LOCATED ALONG A LINE EXTENDING FROM IRONDALE TO BEVILLE LOCK AND DAM…AND MOVING EAST AT 50 MPH. A TORNADO WATCH REMAINS IN EFFECT FOR THE WARNED AREA. TORNADOES CAN DEVELOP QUICKLY FROM SEVERE THUNDERSTORMS. ALTHOUGH NOT IMMEDIATELY LIKELY…IF A TORNADO IS SPOTTED…ACT QUICKLY AND MOVE TO A PLACE OF SAFETY INSIDE A STURDY STRUCTURE…SUCH AS A BASEMENT OR SMALL INTERIOR ROOM. BRYANT DENNY STADIUM…AND MOVING EAST AT 60 MPH. EFFECTIVE THIS MONDAY AFTERNOON AND EVENING FROM 130 PM UNTIL 800 PM EST. TORNADOES…HAIL TO 1.5 INCHES IN DIAMETER…THUNDERSTORM WIND GUSTS TO 70 MPH…AND DANGEROUS LIGHTNING ARE POSSIBLE IN THESE AREAS. THE TORNADO WATCH AREA IS APPROXIMATELY ALONG AND 110 STATUTE MILES EAST AND WEST OF A LINE FROM 50 MILES NORTH OF HICKORY NORTH CAROLINA TO 50 MILES SOUTHEAST OF TUSCALOOSA ALABAMA. FOR A COMPLETE DEPICTION OF THE WATCH SEE THE ASSOCIATED WATCh OUTLINE UPDATE (WOUS64 KWNS WOU3). AND A FEW TORNADOES ACROSS SE TN/AL/NW GA PER THE 18Z BMX SOUNDING. FARTHER N…STORMS IN ERN TN WILL DEVELOP EWD INTO NW NC…ALONG THE OUTFLOW BOUNDARY FROM THE EARLIER CONVECTION THAT CROSSED INTO VA. INSTABILITY WILL BE A LITTLE WEAKER THAN AREAS FARTHER SW…BUT VERTICAL SHEAR REMAINS STRONG…AND THE POTENTIAL WILL REMAIN FOR EMBEDDED SUPERCELL STRUCTURES. LATER DURING THE AFTERNOON…CONVECTION IS EXPECTED TO EVOLVE INTO MORE OF A LINEAR SYSTEM WITH A THREAT FOR DAMAGING WINDS AND BRIEF SPIN UPS ALONG THE BOWING LINE SEGMENTS.